One of the articles titled "The Sweetest Thing" is about Michelle Crawford's family's move to rural Tasmania. Above is their kitchen with many vintage pieces taking a starring role. Check out Michelle's blog, Hugo and Elsa, named after her two children...very cute! Michelle now makes cupcakes under the name C & C Cupcake Factory. 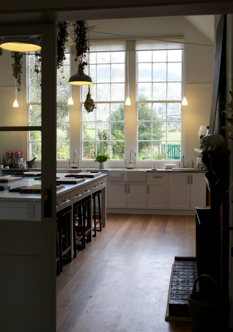 The cakes are based on Tasmanian seasonal produce. And she sells them at the Tasmanian Farm Gate Market, a market I must shamefully admit to not having visited yet. My must-do in Hobart list has just been updated. 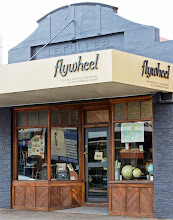 The styling feature (pages 68 to 76) featured many vintage and antique items, much to my delight. I couldn't help but notice the zinc tub from ici et la. We have a few of these coming from our latest buying trip. I imagine olive trees growing in them. I also like the French chair in the above image and the French garden table in the middle image. Oh, and the linen sofa, of course! As well as getting through my magazine stack, I was given a few buckets of beautiful big quinces. I love the smell of them just sitting on the bench but I decided to preserve them for use in tarts throughout the year. 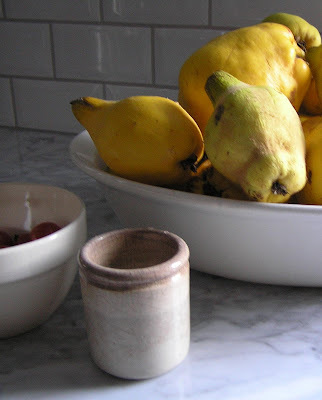 I used my vintage preserving jars to bottle the cooked quinces. Look at the lovely deep red colour they turn when cooked. 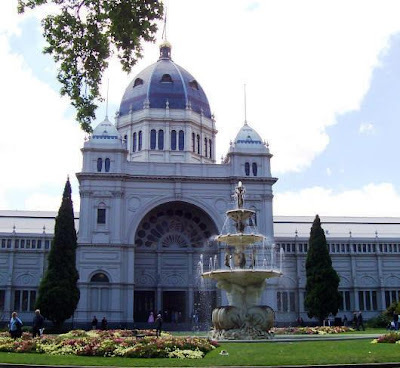 Later this week I will be helping at the Melbourne AAADA antique show. The gala preview starts Thursday evening at 6 pm, but the show continues on Friday and over the weekend. I will report back with my favourite images from the show! I've missed the last couple of posts!! The sweedish cupboard from the previous post is fabulous, isn't it? I think furniture like this is so versatile as you are not limited to just one room with this. I have only just flicked through the pages of the latest Country Style magazine (I am on a self-imposed magazine hiatus) while I was in the newsagency the other day. I missed all the features you have shown. Always good to read about fabulous Tassie and I have to say the garden table with the linen couch really caught my eye. One day I would like to think I will own one of these tables.....we shall see. Have a wonderful time in Melbourne, won't you and look forward to your fabulous photo's when you return! Gorgeous - just love sitting down to read a lovely magazine. 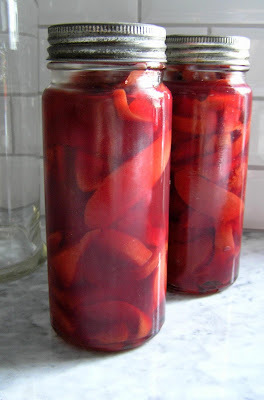 Have been sitting here feeling quite jealous of your beautifully bottled quinces. I bought some recently but had to throw half of them away due to some kind of mould/fungus. Now autumn's nearly over I'm not really sure where to get some more ... Was quite disappointing, but I thoroughly enjoyed the other half ;) Your tarts sound like a fabulous idea!